Summary: This essay is a key reading for individuals and study groups looking to understand the “transformation” that teachers say occurs in writing project institutes and other programs when they write, respond as members of writing groups, revise, and publish. 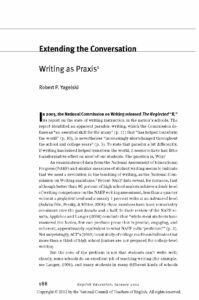 Yagelski grounds his exploration in theory as he considers the power of writing as an active (rather than a passive) pursuit that engages teacher writers in reflective practice. I want to emphasize here that I am not suggesting that we ignore or diminish the importance of writing as a communicative and rhetorical act. Writing is a powerful and essential means of communication, and students must learn to write effectively for various purposes and audiences. They should master the rhetorical skills needed to write effectively in various contexts. But writing is more than communication. It is a vehicle for sustained inquiry into our experiences, a means of understanding who we are. Ultimately, writing is a deeply human act that can help us better understand what it means to be human. It is this dimension of writing—of the experience of writing—that we must open up for our students and for ourselves.